OSAKA - Seven years after the triple meltdown at the Fukushima No. 1 nuclear plant, Fukushima Prefecture remains committed to becoming an international center for renewable-energy research and a domestic pioneer by meeting 100 percent of its energy demand via renewables by 2040. But grid connection issues, investment costs and a government policy that still favors investment in other energy sources — especially nuclear — continue to present challenges to researchers, businesses and Fukushima policymakers with an interest in renewable energy. In 2014, the prefecture announced it was aiming to have renewables supply 40 percent of its energy demand by 2020, two-thirds by 2030 and 100 percent by 2040. 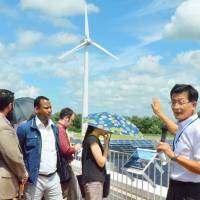 As of April 2017, renewable energy accounted for 28 percent of the prefecture’s energy needs and about 60 percent of its electricity consumption. Fukushima’s installed capacity in renewables, excluding large-scale hydropower, had reached nearly 1.4 gigawatts by early 2017, equivalent to one large nuclear reactor. This included 925 MW of solar power, 209 MW of biomass and 174 MW of wind, with small shares for geothermal (65 MW) and small-scale hydro (17 MW). The prefecture also hosts several organizations promoting renewable energy, including the Fukushima Renewable Energy Institute in Koriyama, which is part of the National Institute of Advanced Industrial Science and Technology. There, researchers look into improving the technology, efficiency and use of several forms of renewable energy, including photovoltaic, wind, shallow geothermal and geothermal. The institute also does research on using hydrogen obtained from renewable energy sources. “With technological support from the institute, a support program for local businesses in the quake- and tsunami-damaged areas is being carried out and human resources are being developed in collaboration with local universities. As a result, there have been 107 joint research projects implemented and nine successful examples of commercialization,” said Masaru Nakaiwa, the institute’s director-general, in an e-mail interview with The Japan Times. “As a research institute playing a role in a new energy society for Fukushima, the Fukushima Renewable Energy Institute has been tying up with local business, and it’s gratifying to see the results,” said Masayoshi Hamada, state minister for reconstruction, after a third tour of the institute in February. Yet while official and public enthusiasm over renewable energy has grown since 2011, and while over 15 percent of Japan’s electricity was generated by renewables in fiscal 2016, Nakaiwa said that does not mean that renewable energy is spreading compared with other OECD countries. “The big problems remain cost and grid connection capacity, although it’s remarkable that we’ve seen a recent movement in the manufacturing industry, the backbone of support for Japan, to steadily expand its use of renewable energy. The United Nations Sustainable Development Goals have drawn international attention, and the fact that visible consideration for the environment is greatly reflected in a firm’s value is thought to be the main reason” for the shift, he said. In September 2016, the central government created a renewable energy plan for Fukushima that meant additional support for maximizing its use in Fukushima, including the development of “smart” communities. The plan gave a particular boost to long-standing government and industry efforts at storing and using hydrogen produced from other renewable energy sources. In January, Tadashi Mogi, a senior official at the Ministry of Economy, Trade and Industry’s Energy Efficiency and Renewable Energy Department, updated a meeting of the International Renewable Energy Agency on what was going on in Fukushima. 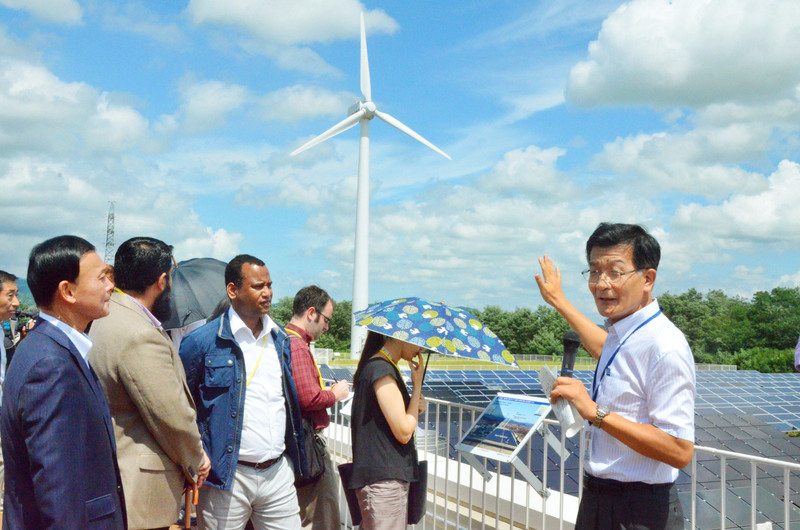 “The potential of solar and wind power in Fukushima is maximized. Currently, delivering the electricity produced by such renewable sources to the large power-consumption areas like Tokyo is unfeasible due to a lack of transmission capacity. But development of transmission lines will begin at a high pace from next year,” he said. Mogi also noted that pilot projects had been initiated at so-called smart communities in five cities and towns in Fukushima. These include Shinchi, Soma, Namie, Naraha and Katsurao. In those projects, electricity and heat from distributed power sources and renewable energy are supplied to public facilities or even an entire urban district. The government sees Fukushima-generated hydrogen in particular as a key energy source and plans to promote it internationally in 2020. 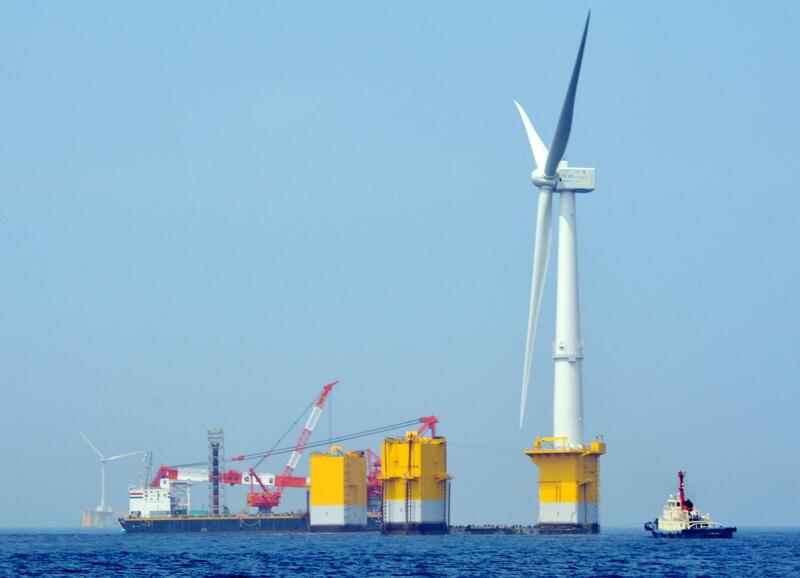 Wind, particularly offshore wind, is another renewable energy source that Fukushima is pursuing. The Fukushima Offshore Wind Consortium is supported by METI and includes major firms like Marubeni, Mitsubishi Heavy Industries and Hitachi Ltd. The project now has three turbines: 2-MW and 5-MW turbines from Hitachi and a 7-MW turbine from MHI. 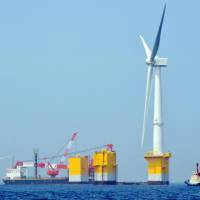 The Japan Wind Power Association has proposed that onshore and offshore wind power provide 36GW of electricity by 2030, equivalent to the output of about 30 nuclear power plants. The central government has set a target of generating 820 MW from offshore wind turbines by 2030. As of February 2017, there were nine offshore wind projects nationwide, including fixed and floating offshore turbines that were generating nearly 60 MW. In March 2017, the association identified a number of problems with offshore wind power in Japan, including cost and poor electric grid infrastructure in areas with good wind like Hokkaido and Tohoku. The more populated central and western parts of Japan, where grid infrastructure is often better, have only moderate wind speeds, making it difficult for wind farms to turn a profit. Also cited as hurdles were legal issues over the common use of sea areas as well as concerns from politically powerful fishing unions. In Fukushima itself, a 2017 prefectural survey showed support for renewable energy remained strong, with 54 percent of respondents saying they wanted to keep using it in their daily lives and 14 percent saying they did not. Between local efforts to meet the 2040 goal of 100 percent use, and central government and business support for Fukushima to become a testing ground for renewable energy technologies, the march toward moving Fukushima from a nuclear past to a renewable future continues.